80 MMS January 2017 mmsonline.com FEATURE rectangular blanks about the periphery of a cylin- drical rotor forging to create those cooling chan- nels (see the photo below). Prior to welding, the rotors were rough-turned on a lathe and then sent to a four-axis horizontal mill that machined flats where the blanks would be located for welding. The manual welding process for each rotor took 50 to 60 hours, and this approach meant othe r subse que nt manufactur ing ste ps also be c a me ne ce s s a r y. For exa mple, the we lds required quality inspections to ensure that proper penetration was achieved and that the welds were free from cracks. In addition, a pre-balancing operation for just the shaft was commonly per- formed prior to balancing the entire rotor assem- bly. This was necessary because of the natural imbalance that occured due to the inherent vari- ation in resulting weld thickness from one welder to another. Plus, the heavy welding operations created a good bit of stress inside the rotor. Kris Miller, systems engineering manager, explains that, as a motor heats up during operation, the stresses in rotors with the welded-shaft design change and shift, causing an imbalance that's evident in vibration testing. 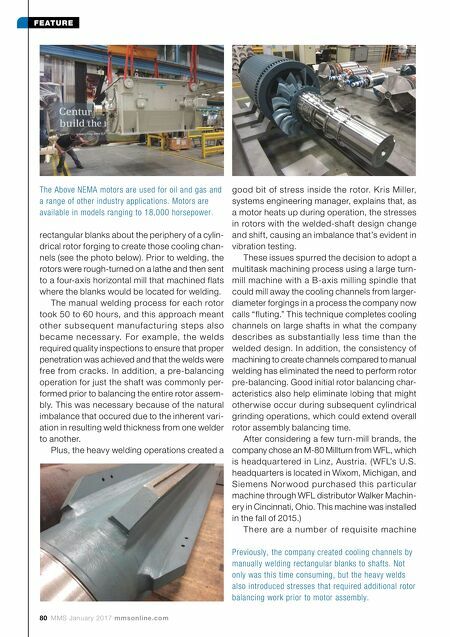 These issues spurred the decision to adopt a multitask machining process using a large turn- mill machine with a B-a xis milling spindle that could mill away the cooling channels from larger- diameter forgings in a process the company now calls "fluting." This technique completes cooling channels on large shafts in what the company describes as substantially less time than the welded design. In addition, the consistency of machining to create channels compared to manual welding has eliminated the need to perform rotor pre-balancing. Good initial rotor balancing char- acteristics also help eliminate lobing that might otherwise occur during subsequent cylindrical grinding operations, which could extend overall rotor assembly balancing time. After considering a few turn-mill brands, the company chose an M-80 Millturn from WFL, which is headquar tered in Linz, Austria. ( WFL's U.S. headquarters is located in Wixom, Michigan, and Siemens Nor wood purchased this par ticular machine through WFL distributor Walker Machin- ery in Cincinnati, Ohio. This machine was installed in the fall of 2015.) T he re a re a numb e r of re quisite mac hine The Above NEMA motors are used for oil and gas and a range of other industry applications. Motors are available in models ranging to 18,000 horsepower. Previously, the company created cooling channels by manually welding rectangular blanks to shafts. Not only was this time consuming, but the heavy welds also introduced stresses that required additional rotor balancing work prior to motor assembly.